One of the finest book shelf loudspeakers you can find on earth, combining with Volent Patented Twin-Ribbon technology with specially designed 7” titanium cone woofer. Its patented dual Neodymium magnetic system, ‘Air System’ is designed for producing the finest detail you can imagine. 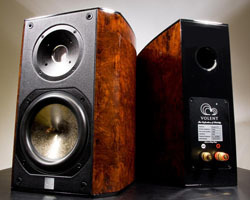 Paragon VL-2 performs the best sound quality with Volent's self made Twin Ribbon Tweeter that pioneering other bookshelf speakers. With unique 3.8cm Ribbon tweeters, Paragon VL-2 performs up to 50,000Hz which gives you the most vivid sound atmosphere. Paragon VL-2 equipped with Graphite/Titanium sandwich based 7" woofer, so as to perform the best sound quality. The inner cone is made of Syntactic Polymer Hardfoam, outer layer is Graphite with Titanium ionized and sprayed on its surface. The merits of using both Graphite with its elasticity and Titanium's stiffness are combined and give the details bass. With its patented " Air " system, special designed Copper Faraday Ring, the counter-electomoive force is therefore minimized, the result is the bass is definitely the fastest and without losing any details. Paragron VL-2 was equipped with distinctive quality wood board, 100% wool fillet and aluminium back plate, constituting a state-of-art combination of your dream loudspeakers.